James’ undoubted ability was often placed in the shade by the memory of widely publicised off-field discipline problems early in his career at Collingwood. 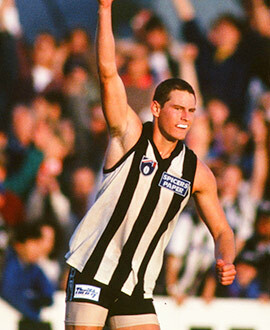 The Magpies cut him loose from the list in mid-1997. An athletic type from Western Jets who marked well, he suffered a bad knee injury in 1996 which sidelined him for 12 months. Richmond gave him a second chance and he repaid the faith in the latter part of 2000, but injured his knee in the final game. He resumed midway through 2001, but could not regain his place and was delisted at the end of the season. The Bulldogs gave him a third bite at the cherry when he was drafted in the off-season, but he managed just one game.